Joy Creek Photo Archive (c) all rights reserved Reports vary on the ultimate height of Ribes sanguineum 'Elk River Red' but in our garden it has been slow to grow. From our research, we find that this was collected in about 1970 at Elk River which is near Port Orford, OR. 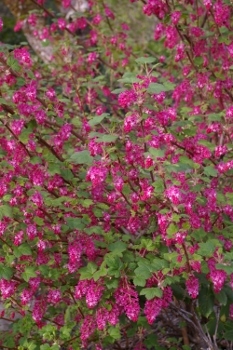 Our experience also confirms reports that this is early to bloom, a few weeks earlier than the well-known Ribes 'King Edward VII'. We admire the bushy habit of this shrub and the gayness of its flowers during a chilly time of year. It is equally admired by resident hummingbirds. In the autumn, the shrub bears dark fruits that are covered with a whitish bloom. The 5-lobed leaves turn an attractive golden color before they fall. Spring. 6 ft. x 4 ft.